On August 30, 2012, the New Zealand Herald, in an article by Kate Shuttleworth, reported that the Whanganui River has been granted legal status. This is believed to be the first time that a river anywhere in the world has been given such status. The iwi, who are Maori people, have signed an agreement with the government which recognizes the river legally as a person. According to a Wikipedia article, the word “iwi” does not really mean “tribe,” its meaning is closer to “people,” and it refers to the social structure of the Maoris. 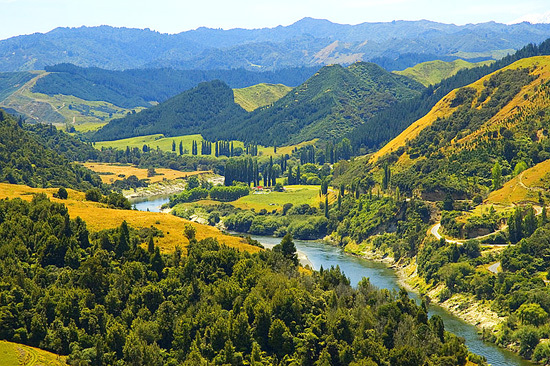 The Whanganui River, New Zealand’s third longest river, runs for 180 miles (290 kilometers) through the North Island. The river has 200 rapids and is much appreciated by tourists for its white water. Before the arrival of Europeans, many Maori villages were, and still are, located along the river, which has always held special importance for the Maori people. The Whanganui River iwi (the native people) have been in negotiations related to the river since 1873, seeking both their own rights and protection for the river. Further details in the agreement are still to be worked out. The principle agreed to is that the river is, in the eyes of the law, a legal person and will be represented in the future by two guardians, one from the iwi people and one from the government. This development could set a precedent for establishing the “personhood” of natural entities in other countries, and that, clearly, would put efforts to protect them on a sounder footing. To read the article in the New Zealand Herald, click here.